Anyone who questions the value of coaching to a hockey player’s career ought to talk to Mike Mottau. The Avon, Massachusetts native is the all-time assist leader at Boston College, totaling 130 for his career. 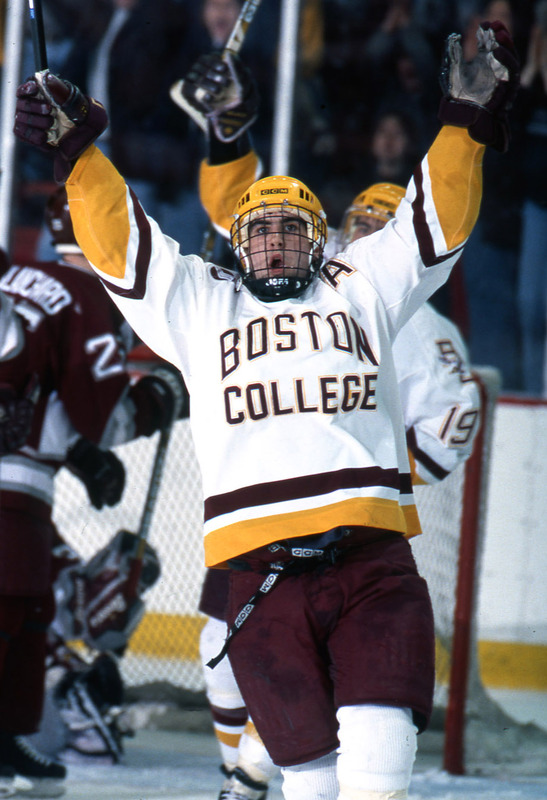 His 157 points in four seasons, most ever for an Eagle defenseman, place him 21st on BC’s all-time scoring parade. He holds the Hockey East career record for assists with 97. That makes him an “offensive defenseman,” by any measure. Or does it? Mike was also voted the league’s best defensive defenseman in his senior season. He won the Hobey Baker Award as the nation’s top college player. He took home the both the Walter Brown Award as New England’s best college player and first-team All-America honors for the second time. If ever there was an all-around player who excelled at both aspects of the game, aspects which are frequently mutually exclusive, it was Mike Mottau. He followed up his college career with 14 professional seasons than included seven in the National Hockey League. When asked how it all happened, Mike is quick to credit his coaches and mentors, from youth up through the NHL. And even before he received formal coaching, there was brother Rob, five years Mike’s senior, who’d played at Division One Illinois-Chicago. “Rob let me play pond hockey and street hockey with him and his friends when I was five or so. I had to elevate my game, even at an early age,” said Mike. When Mike was about seven, youth coach Vin Magno introduced the concepts that started him along the road to lifelong development of his Hockey IQ, as he puts it. He learned, among many other things, how to recognize a forechecking pattern, and why moving the puck to a breaking teammate was better than trying to carry it up ice himself. “Those ideas and concepts were foreign to me at that age, but when I got to Thayer Academy I was able to make the varsity as a freshman because my thought process about the game was so accelerated,” stated Mottau. Thayer coaches Jack Foley and Kevin Sullivan used advanced, European-style drills, stressing puck movement and protection. They had defensemen play as forwards in practice, and vice versa, to expose their players to every nuance of the game. ”Looking back on it, it was the influence that those guys had on my hockey IQ that allowed me to eventually play in the NHL,” says Mike. When college approached, Mike seemed destined to play at Boston University. The Terriers were riding high, and Jack Parker was interested. But before committing, Mottau decided to look around. His former Thayer teammates Dave Wainwright and Dave Hymovitz showed him the campus. Mike had played against Marty Reasoner, who was already in board, in national junior competition. He also knew Jeff Farkas, who had committed to BC earlier. “I could see the upside at BC. And my parents let me do my own due diligence and make the decision without any outside pressure. Best decision I ever made,” he says. Mottau became a regular right away, as part of Jerry York’s youth movement. It wasn’t easy at first. The speed of the game, and an inability to recognize what was going on around him brought growing pains. Mike scored 38 points as a freshman when the team went 15-19-4. Sophomore season was the breakout one. He led the nation’s defensemen in scoring with 49 points. The 25-9-5 team made it all the way to the national title game and lost a heartbreaker, 3-2 in overtime to Michigan. BC Coach Jerry York and Mike at the dedication of a sign honoring Mike in his home town of Avon, Massachusetts. 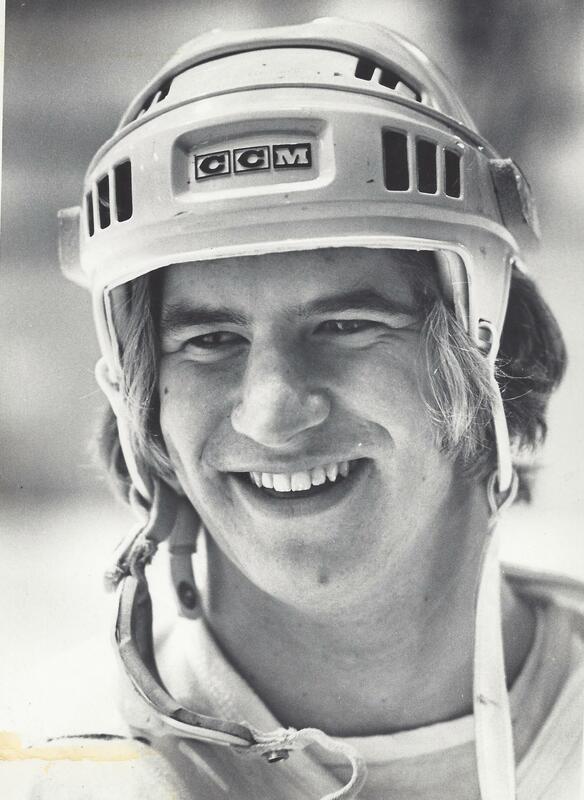 Continued perceptive coaching and heady defensive play led to Mike’s lengthy professional career. Drafted by the Rangers, he played mostly in the minors for seven years. It was some contrarian advice from minor league coach John Paddock put Mike on the path to the National Hockey League. 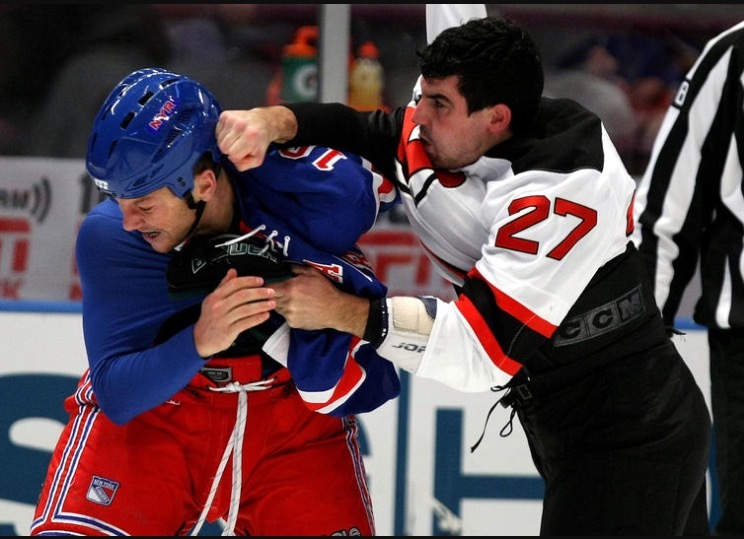 A training camp injury to another defender brought Mike up to the New Jersey Devils for four exhibition games before the 2007 season. He made the most of that opportunity won a full time spot. Coach Jacques Lemaire recognized and appreciated his heady play, and rewarded Mike with more than 20 minutes a game of ice time. “Lemaire was one of the best coaches I ever had. He ‘got it’ in a different way from many pro coaches. He valued good decision-making,” said Mottau. Mike retired from the game at age 36, after 14 professional seasons and 321 games with six different teams. He had a wife and four young kids by that time. It was time to hang them up after the Florida Panthers offered him a two-way contract. Mike and his wife Courtney, who met in freshman year at Thayer, have four children: son Ryan, age 10, and daughters Rowan, 8, Madelyn, 7, and Brooke, 5. Mike scouts part-time for the Chicago Black Hawks and works in wealth management with Morgan Stanley. On behalf of Jackie’s son Patrick and all of Jackie’s brothers and sisters, I thank you all for being with us this morning. Your presence here and your thoughtfulness during recent weeks has meant a great deal to everyone. So let’s share some of those memories of my brother. I’m sure you all have many favorite ones, as do I. Jackie is with us now in spirit, his pain is gone, and he wants us to smile when we think of him today. Childhood. Jackie was born ten years after I was. That decade’s age difference let me be the big brother in ways that Peter and Jimmy weren’t able to. I delivered newspapers all through grammar school, and my bike was equipped with a special, extra-large, industrial strength wire basket on the front. It was ideal for carrying 75 Boston Globes or one two-year old boy. When I was taking care of Jackie, I used to love riding about the town with him in that basket. We’d go to the parks, the playgrounds, the beaches. Every time down at Winthrop Beach, he would point out “the balls.” Those giant golf-ball domes atop the Fort Heath radar towers. It’s so much fun showing new and wondrous things to little ones. And for me, on those rides around town, I got to show him off to all the friends I’d meet. Especially to the girls. How I loved to do that. I was so proud of my baby brother. Adolescence. That meant hockey memories. They begin with all those years of my mother and Catherine McDonald driving Jackie and the McDonald boys here, there and everywhere. They all became very good hockey players, and when they got to high school they played together on the “Irish Line.” Jackie was the right wing, Bobby the center and Joe the left wing. They were the highest scoring high school Division One line in the state in 75-76. They won the East Coast Aero Tech Trophy for that. They’re in the Winthrop High Hall of Fame. Jackie did pick up one edgy little habit along the way. When he scored a goal, sometimes he’d rub it in by turning his stick around and pretending he was shooting the goalie with the Ugly Gun. The Danvers athletic director complained to Jim Evans, and he put a stop to it. I was there for those state tournament games at the Garden. That third overtime against Norwood – after midnight – Jackie stealing the pass in the Winthrop zone and going in alone for the winning goal, 4-3. Then again in the Eastern Mass final against Braintree, he got the game winner. I made it into the locker room after the Braintree game. Reporters were all over the place, and I happened to catch a glimpse of one guy’s notepad after he interviewed Jackie. By that time, word had gotten out that he was the nephew of the late Walter Brown, and Jackie told the reporter that he used to come in to the Garden and practice with the Bruins. Well, Jackie was five when Walter died in 1964. He never knew his uncle Walter, and he certainly never practiced with the Bruins. I tapped the reporter on the shoulder and asked him not to include that tall tale that Jackie concocted in the flush of victory. Sorry, Jack. I’ve never told anyone about that. But I think I saved you a little embarrassment. Not that your uncle wasn’t pleased to see what you’d done, watching from the Second Balcony. He coached the first American World championship hockey team, he ran the Garden from 1937 to 1964, he was president of the Bruins, and he never had a hockey thrill like that from any family member. Those were great times. I knew that I’d never see a performance like that again. I was so proud of my younger brother. When the cancer came, it was horrible. It’s an angry, diabolical disease. Neither surgery nor intense radiation could slow it down. But Jackie fought it all the way. He got excellent support from his nurses, especially Colleen Kilbride, and from Patrick, a trooper during that battle just as he had been for his country, when he served in the US Marines in both Iraq and Afghanistan. Jackie’s friends rallied to put on a nice benefit evening for him – Charlotte Macrillo Flynn, Owen Gillis, Sharon McCarthy and their committee. Jackie was fighting a lonely battle but he wasn’t alone. That wasn’t what I’d hoped to hear at the time. And eventually he relented. Patrick brought him to the hospice in Danvers to next day. The following morning, Jackie was asleep when Peter stopped by to visit. I was getting ready to leave and go up there later in the day when Peter called. Jackie had not awakened, but had died that afternoon. So the last time I saw Jackie, he was still fighting, still battling against odds that had become impossible. But maybe that’s just what we should expect of a hockey player. I was so proud – I am still so proud – of my brother. Jackie, now it is time to say goodbye. You’re back with Mom and Dad. You’ve probably already been in on some pickup hockey games. And if they designed it properly, hockey players’ heaven is the old Boston Garden, that House of Magic where you had your greatest triumph. It’s jammed with 13,909 souls. And Mom, Dad, Uncle Walter, and all the rest are cheering you on from Section 34, Rows C and D.
Please give them our love. Your brothers and sisters, and all of us here today, will be along to join you by and by.